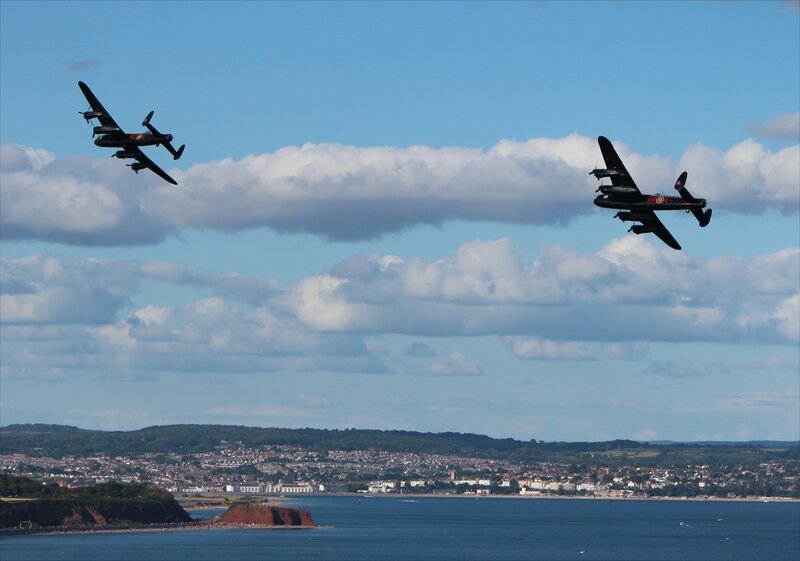 I had resisted the lure of the air show at Dawlish until last year, joining 100,000 spectators to watch the rare sight of two Lancasters and other delights against the red cliffs of the South Devon coastline. 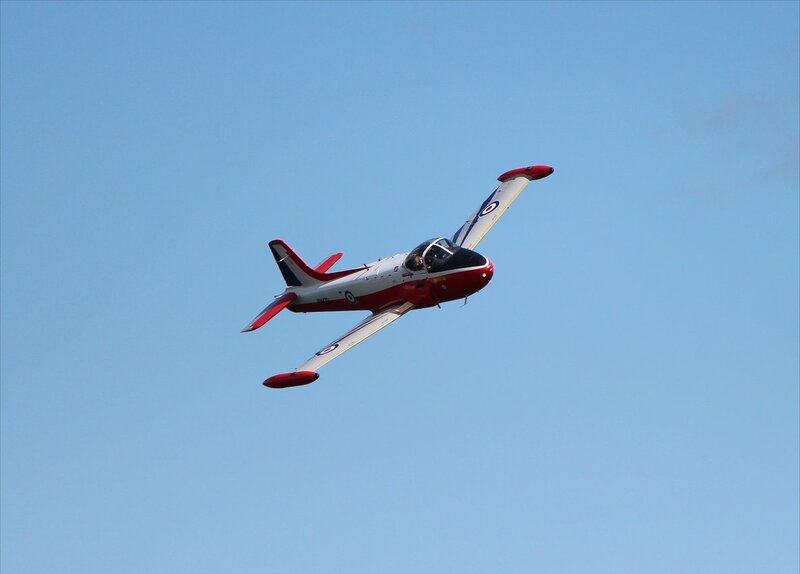 It didn’t take long to appreciate why this air show was so beloved of photographers and I had a suspicion that I would be back sooner or later. 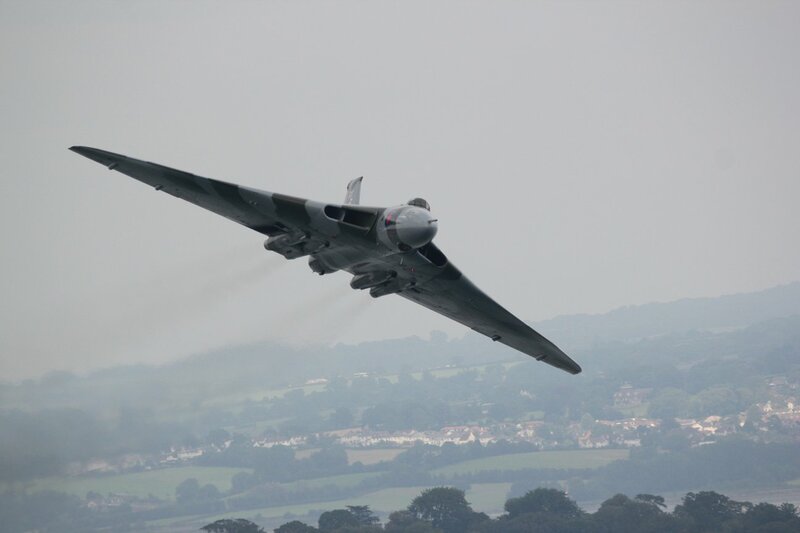 In the end the temptation of saying a last farewell to the Vulcan at such a special location proved too much and I booked some train tickets for a mad day trip to the show. 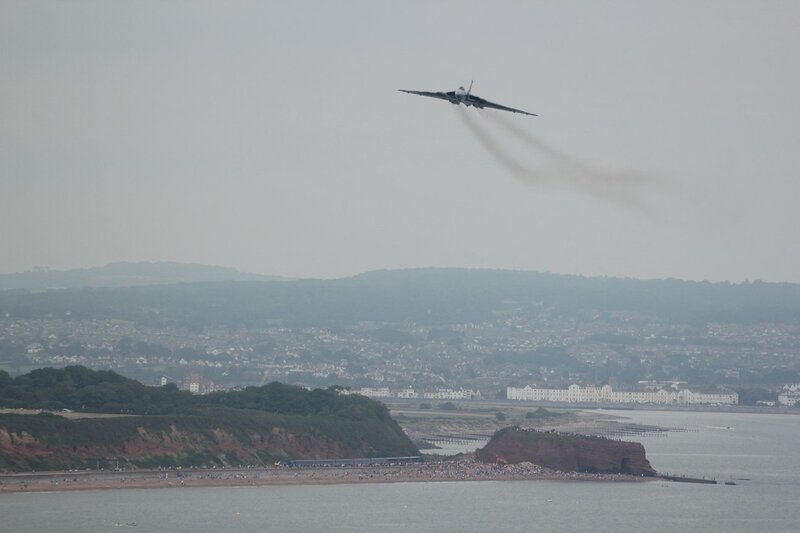 The plan looked more than a little foolish in the build up to the day, with forecasters predicting a devilish mixture of clouds and rain. 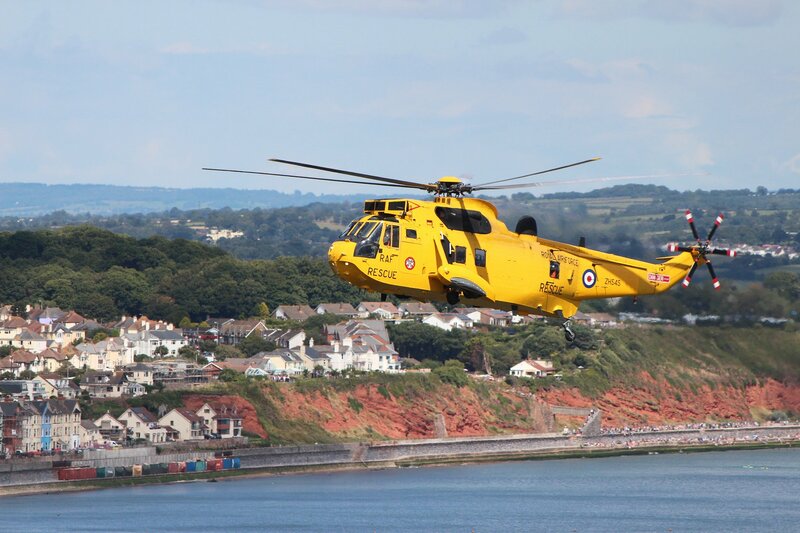 I was grateful to find that this was one of those occasions where the reality was rather different, arriving in Dawlish to the welcome sight of blue skies and sun. 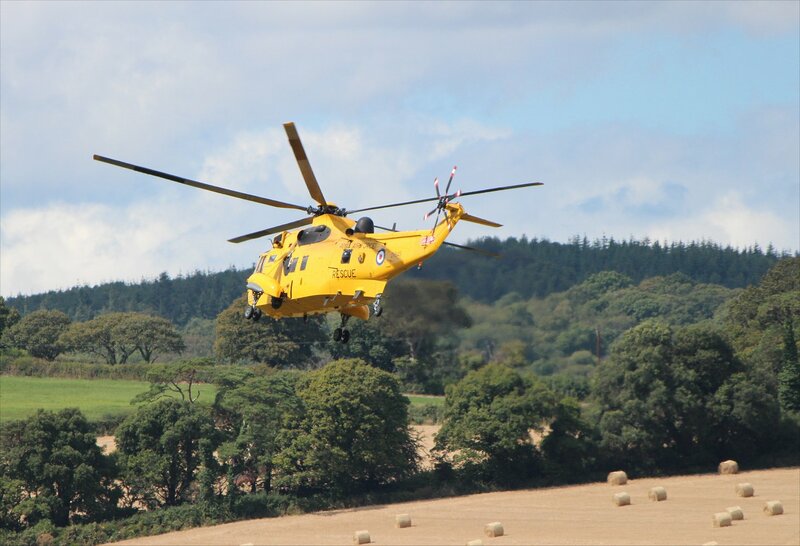 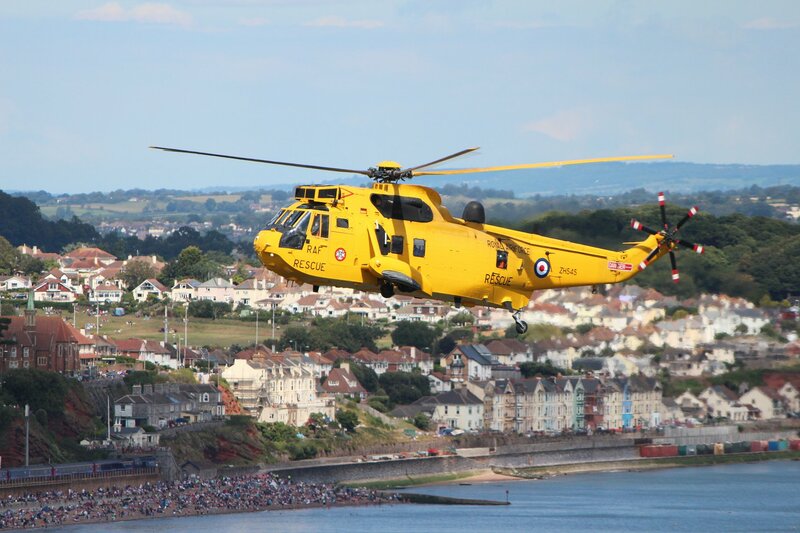 The air show is dependent on donations and sponsorship, all of which came into sharper focus this year with an impressive crowdfunding campaign to bring the Vulcan to Dawlish one last time (£10,000 was raised in the space of a week). 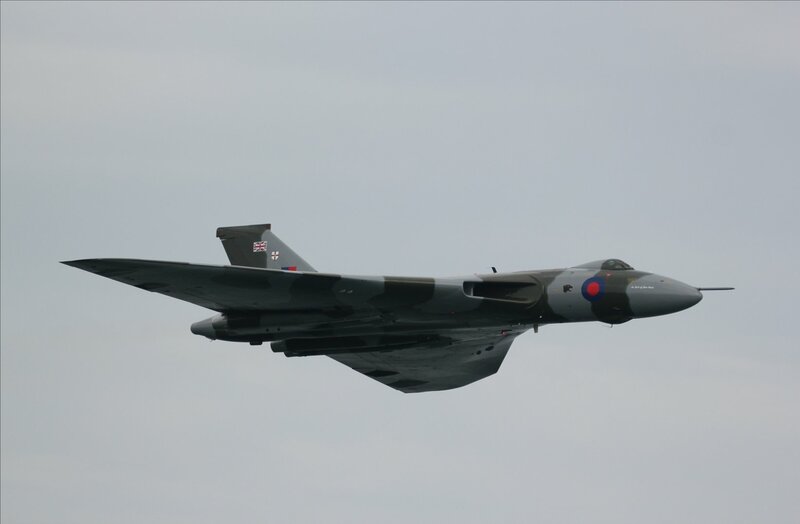 Sadly, bad weather was rapidly closing in when the Vulcan arrived but she still gave us a wonderful reminder of why she will be much missed when her flying days come to an end next month. 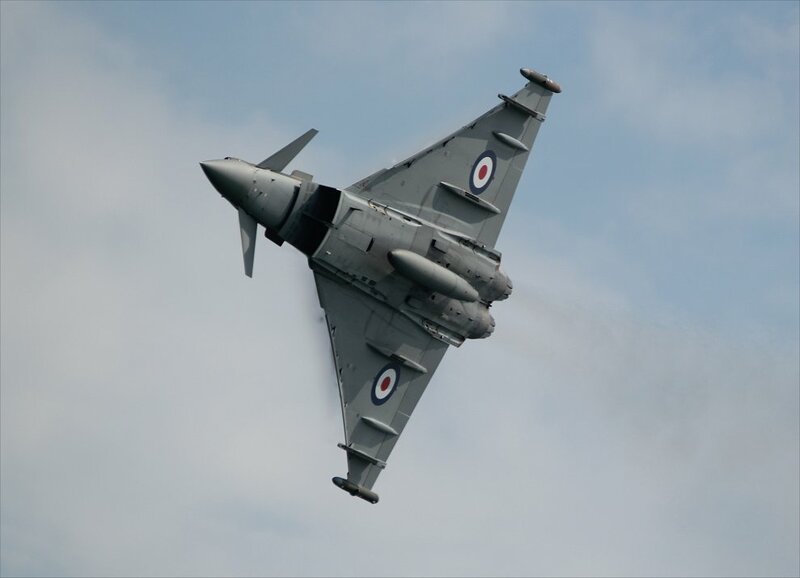 Other highlights of the day include a terrific display by the Typhoon and a delightful duet between the Strikemaster and Rich Goodwin’s Muscle Biplane. 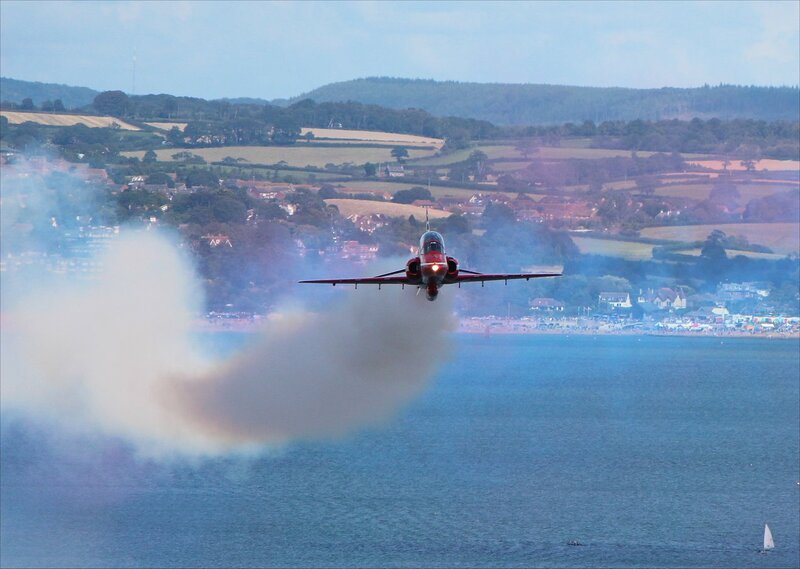 The flying display finished early to the accompaniment of thunder, lightning and rain but given the dire forecasts it was amazing that they managed to squeeze in as much in as they did. 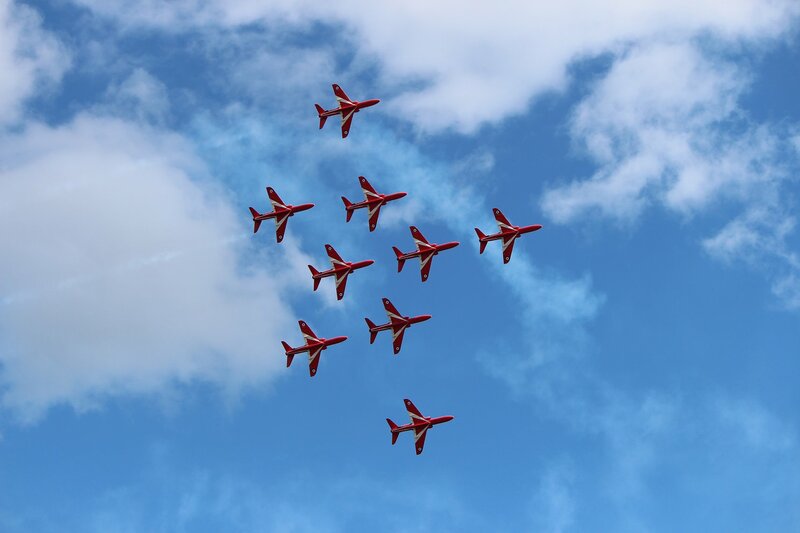 I did not get to hear the news about the terrible events that had unfolded at Shoreham until I returned home late in the evening. 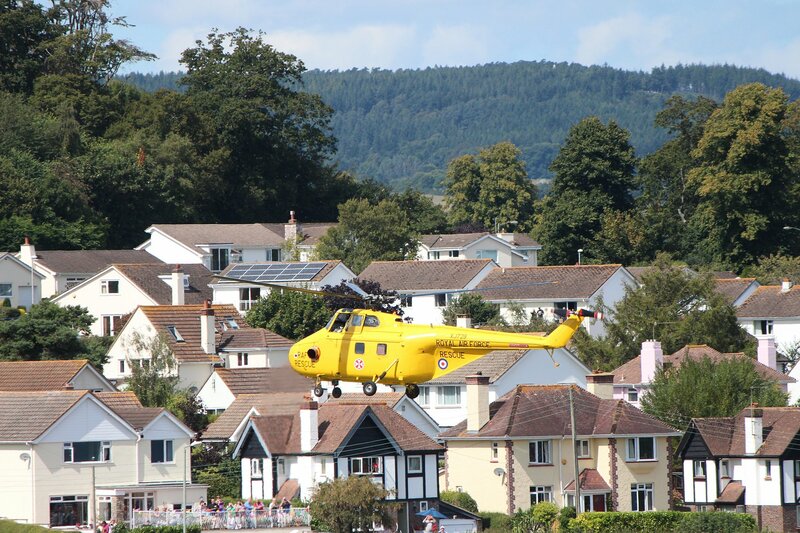 My thoughts go out to everyone caught up in the tragedy. 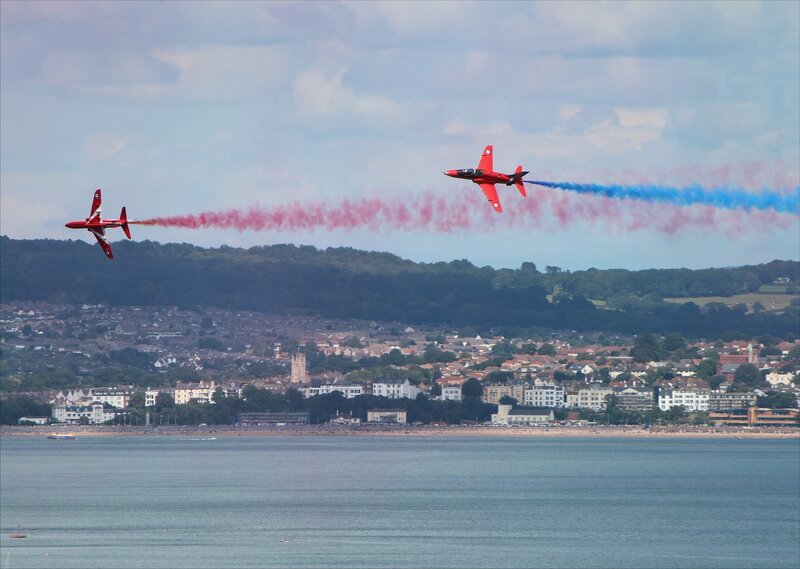 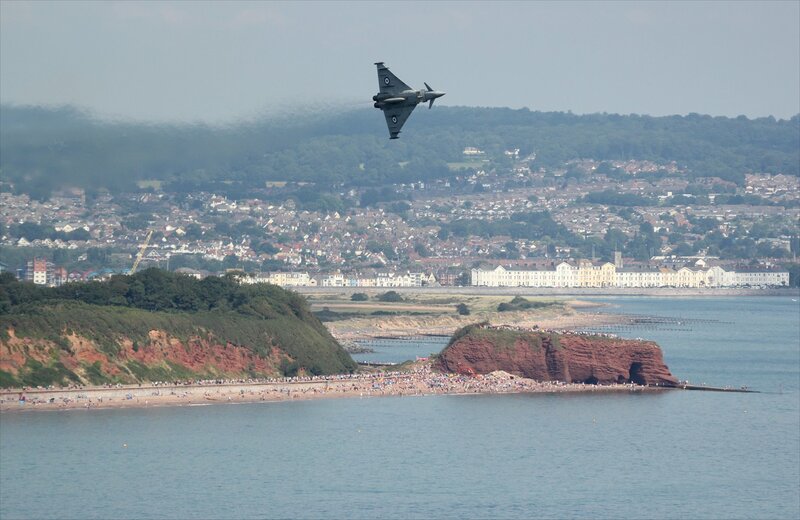 I have long intended to make a trip to Dawlish to see the free airshow that takes place every year, attracted by the many wonderful images that have been published online. 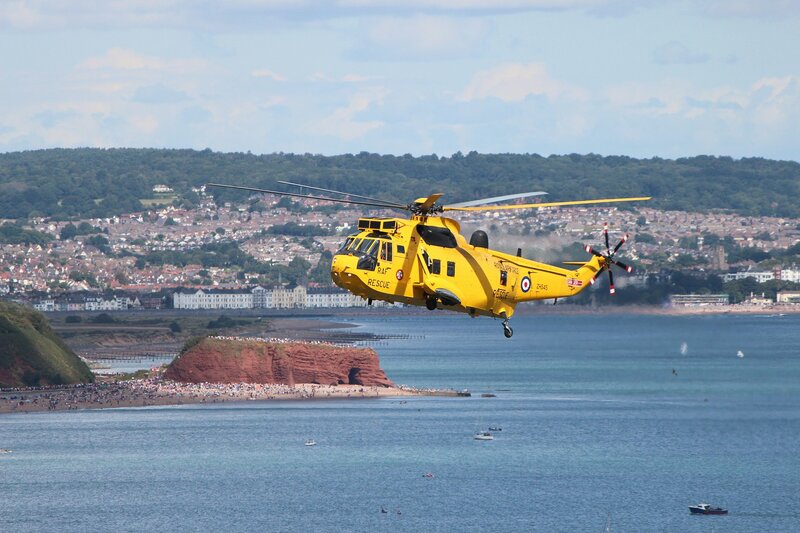 The delightful vista of the coastline that presented itself to us as we took up a spot on the hillside near the Smugglers Inn fully justified our travels. 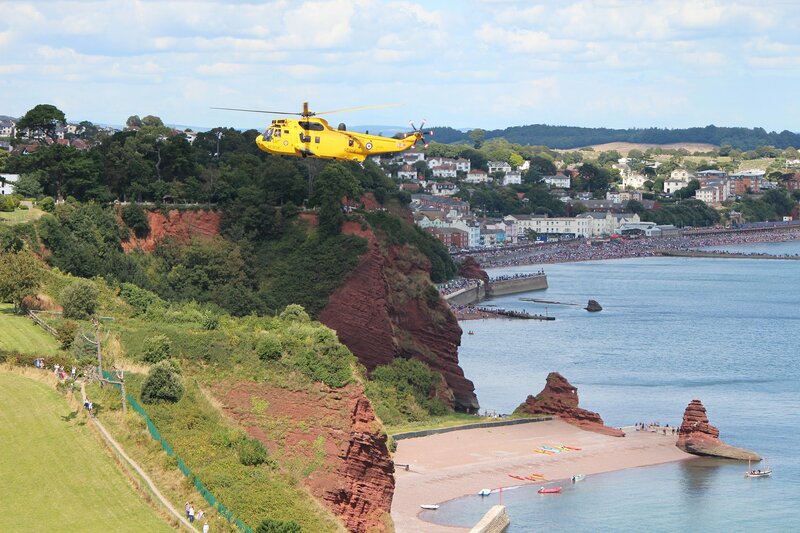 The entire coastline from Shell Cove to Langstone Rock looked stunning and quite astonishingly full of people. 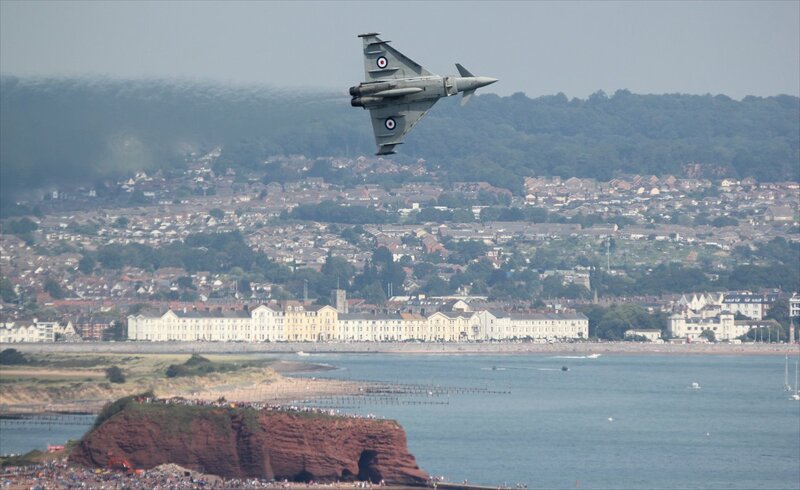 Early reports indicated that there were around 100,000 spectators with over 9,000 alone arriving by train. 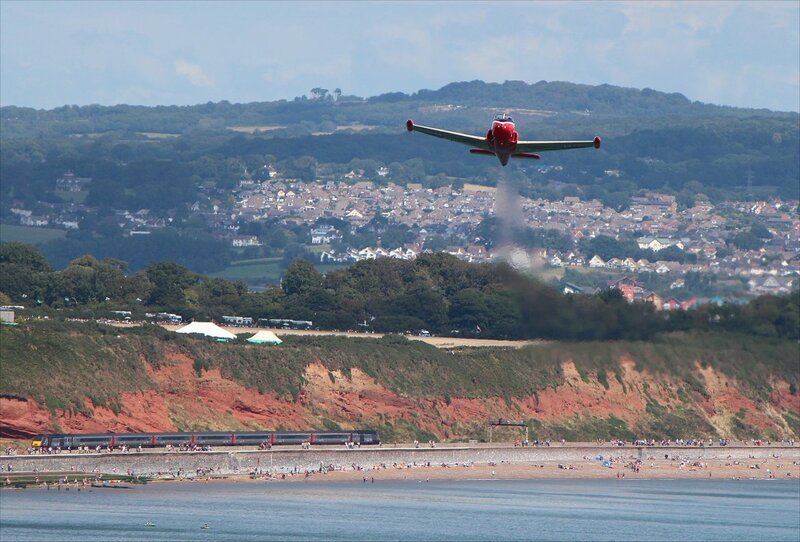 We had arrived fairly early in the day and managed to get on a train without difficulty, but later trains must have been heavily packed. 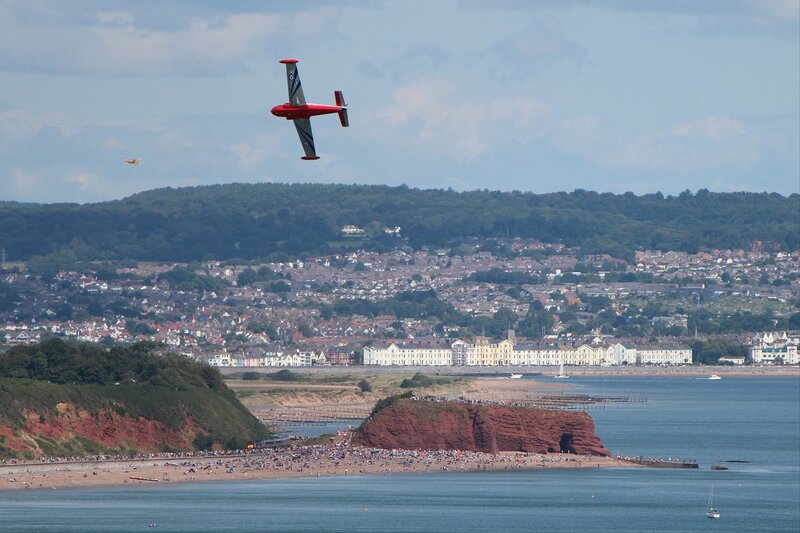 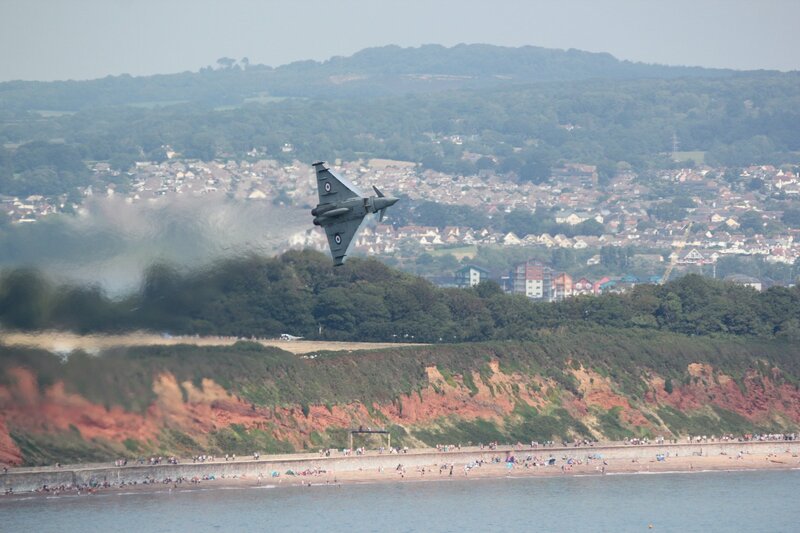 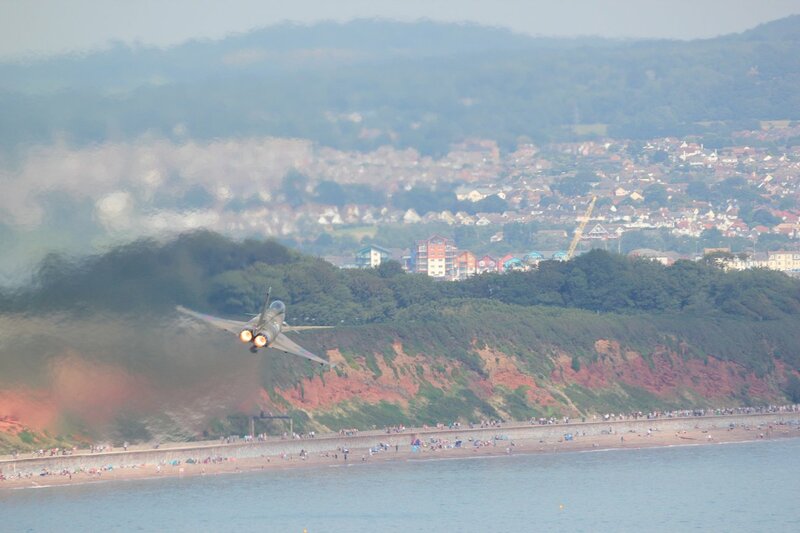 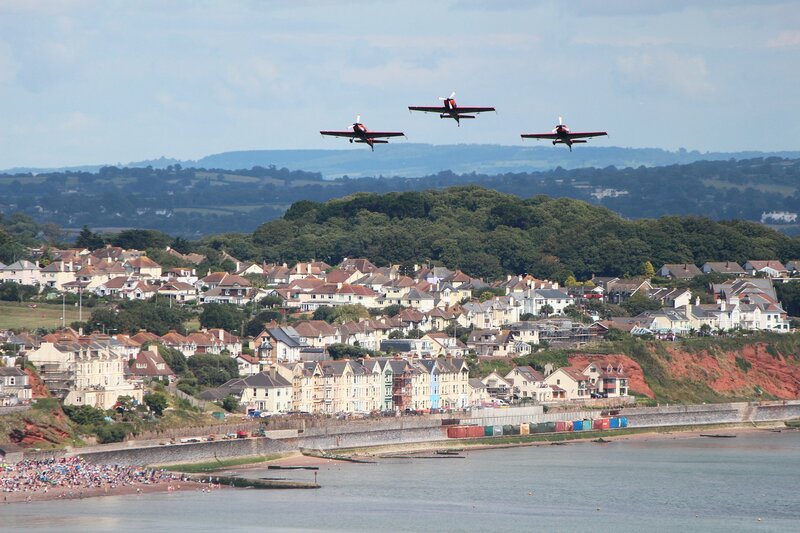 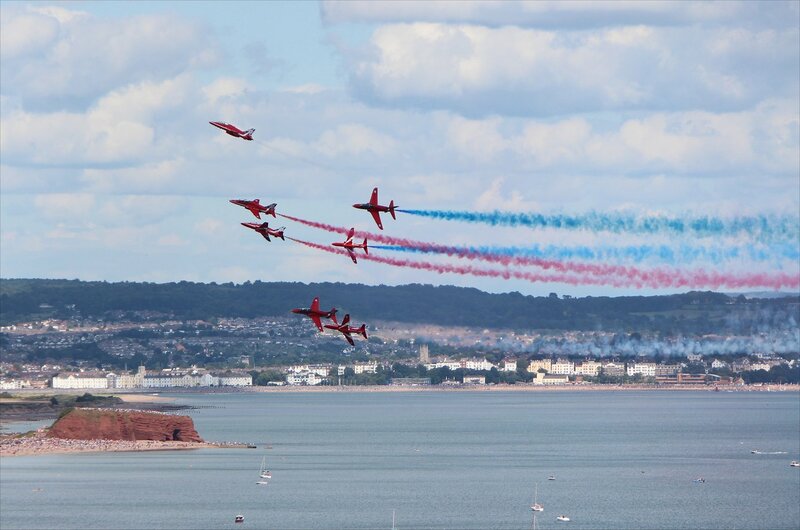 The tide was was coming in throughout the afternoon, limiting available spectator space on the beach, but the beauty of this airshow is the large number of viewing spots – as well as the hillsides above the town there are good views available from Coryton’s Cove, the top of Langstone Rock and even a more distant view from the coastline around Exmouth. 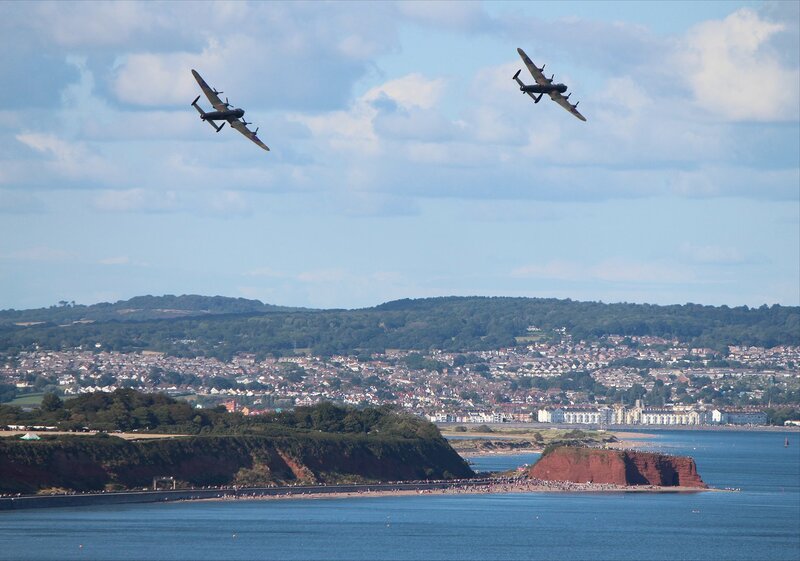 In my opinion, it is hard to beat the view from the hillside near the Smugglers Inn and the possibilities this offers photographers. 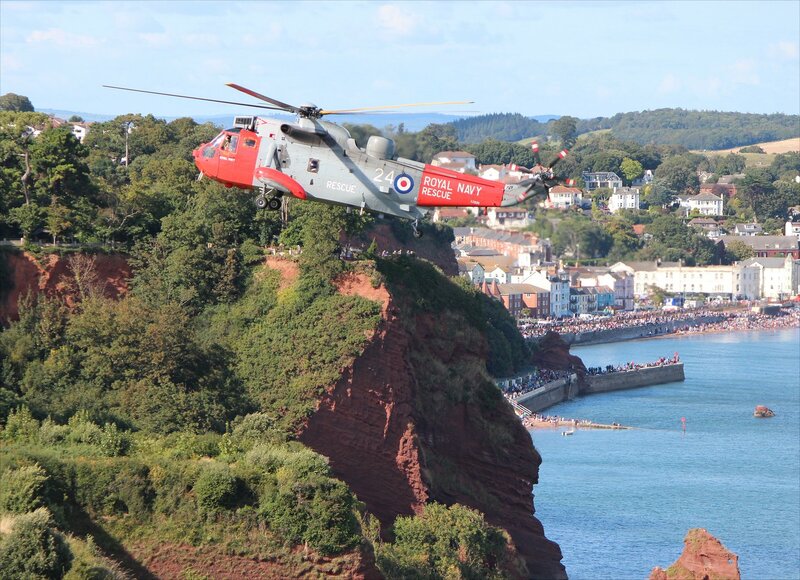 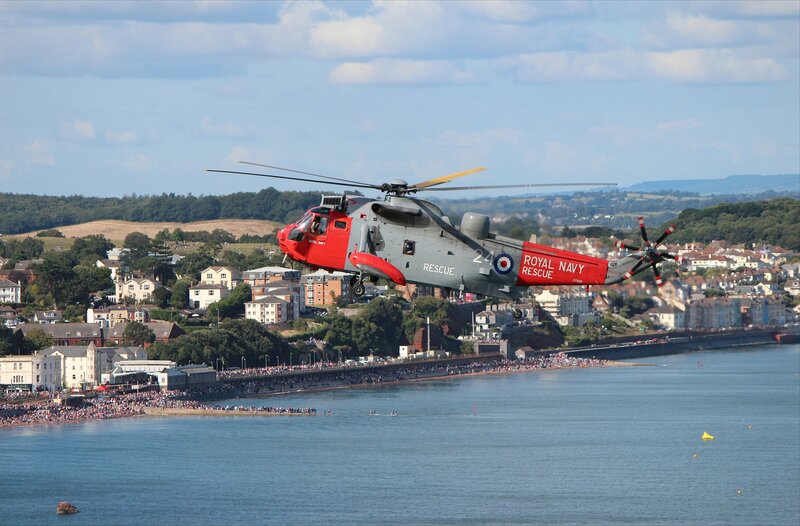 The airshow at Dawlish is all the more remarkable because it is dependent on donations, sponsorship and programme sales to ensure that it can carry on from one year to the next. 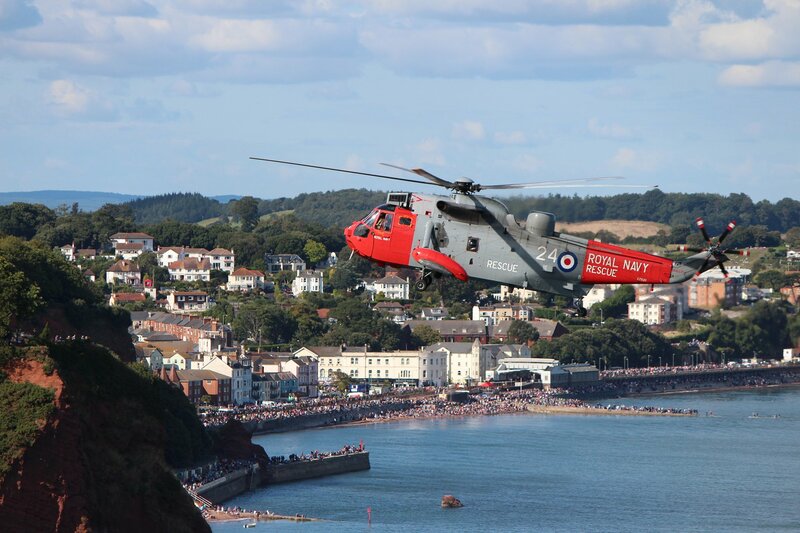 I was more than happy to contribute, having read about the incredible fundraising efforts of the organising committee. 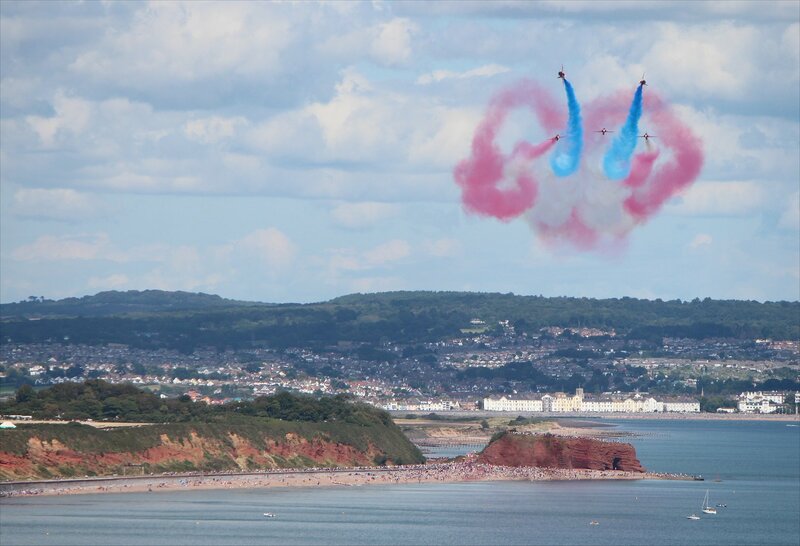 The Red Arrows are guaranteed crowd pleasers and always spectacular but their display seemed even more dramatic against this backdrop, whizzing over the top of us on the hill and delivering a remarkable sequence of moves. 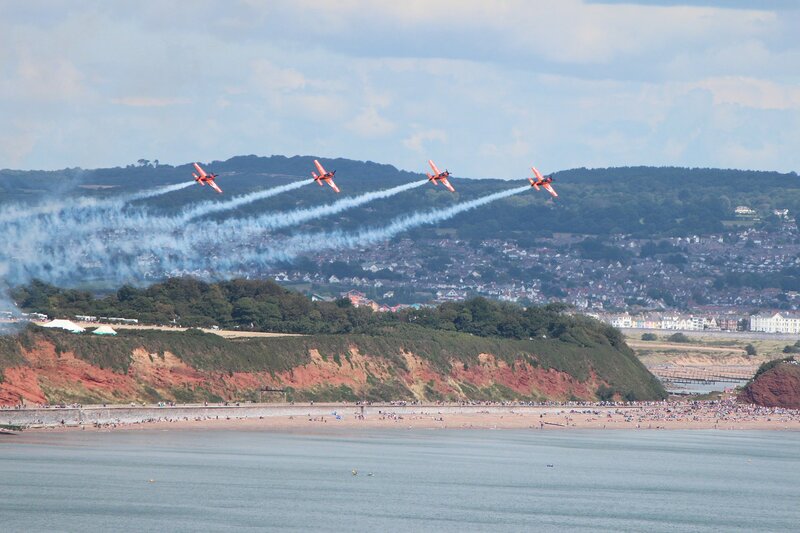 The display team are now in their fiftieth season and every time I see them perform their acrobatics I am left in awe of the skill of the pilots. 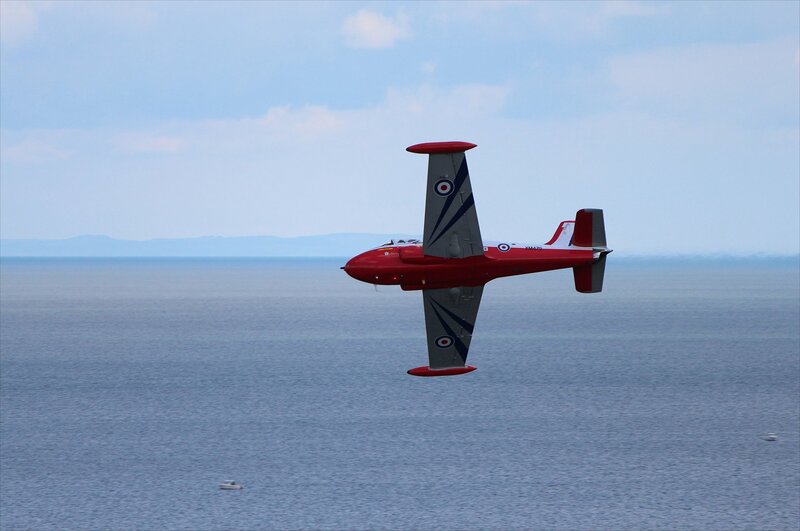 Indeed, we had further evidence of this from the synchronised acrobatics of the Blades, a team made up of former Red Arrows pilots. 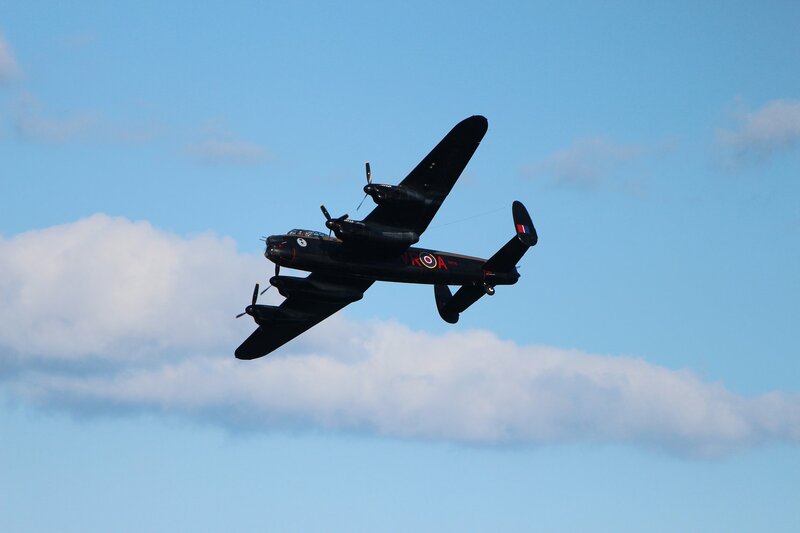 The star attraction of this year’s show was undoubtedly the pairing of the world’s only two airworthy Lancasters which closed the day in style. 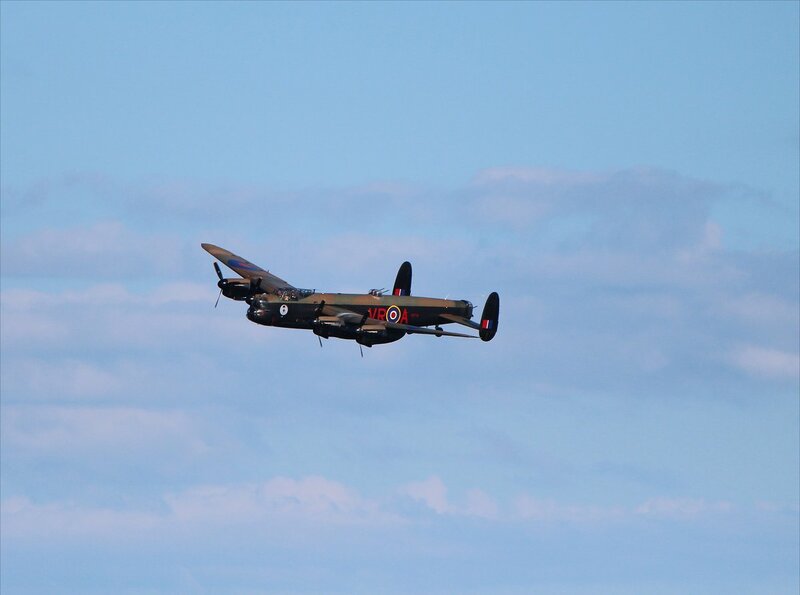 The RAF Battle of British Memorial Flight’s Lancaster PA474 (currently painted to represent Lancaster DV385, of 617 Squadron, using the code letters ‘KC-A’) was joined by the Lancaster from the Canadian Warplane Heritage Museum (currently painted to represent KB726 – VR-A which flew with RCAF No. 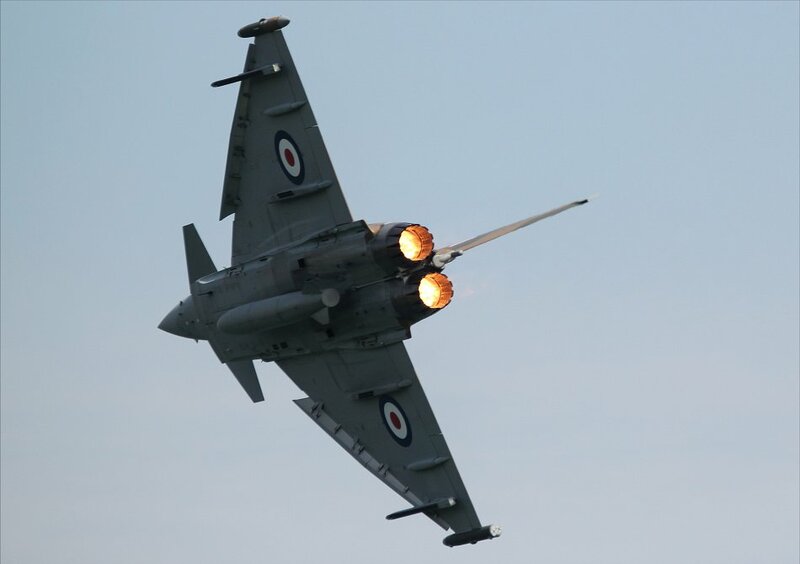 419 Squadron). 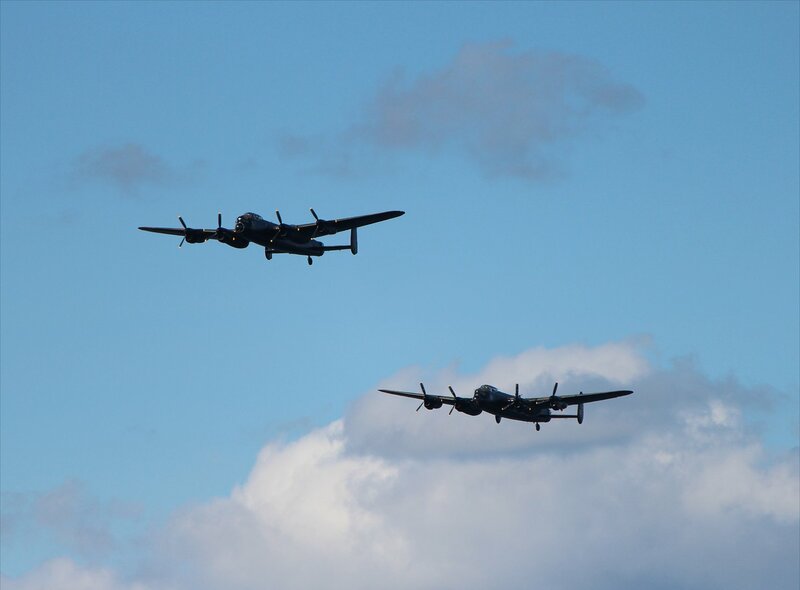 The Canadian Lancaster is making a two month tour of the UK having crossed the North Atlantic via Goose Bay and Reykjavik. 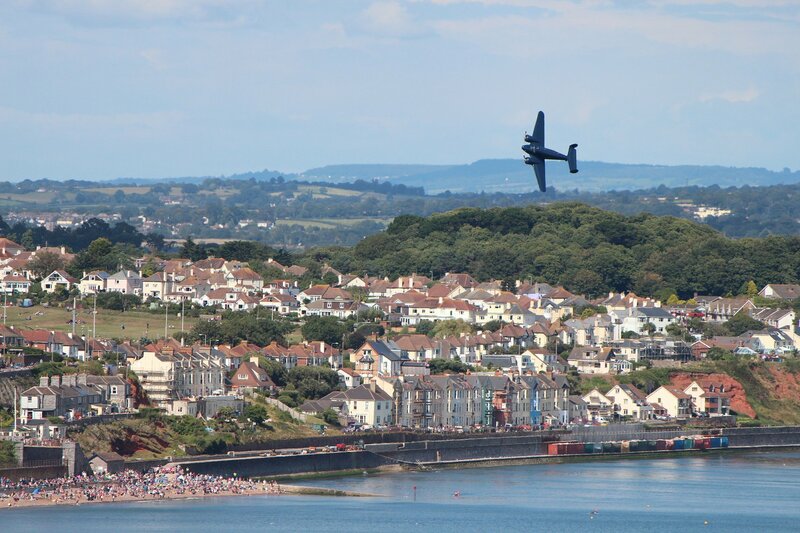 The Lancaster arrived on August 8th and is scheduled to start her homeward journey to Canada on September 22nd. 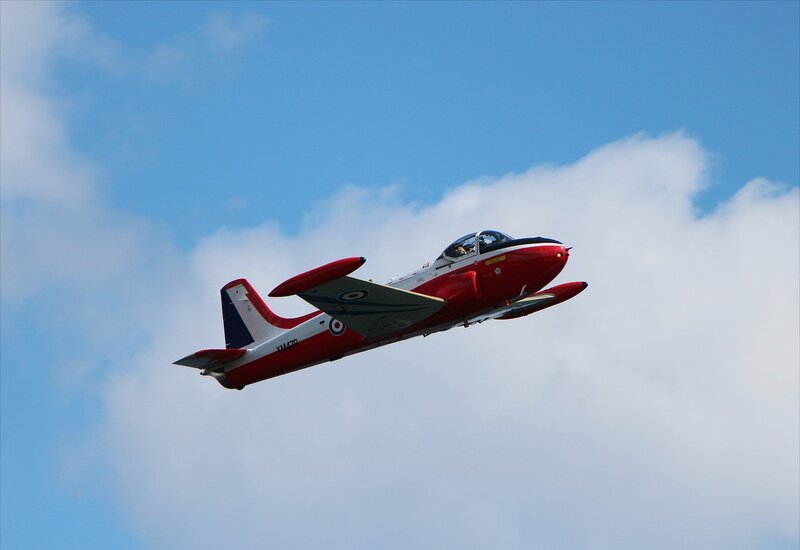 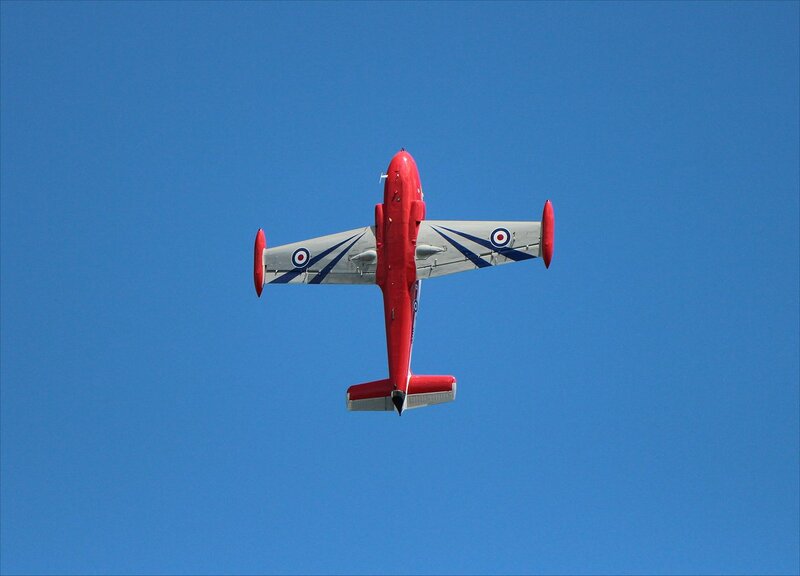 My personal highlights from the airshow were the two classic jets – the Jet Provost T3 and the English Electric Canberra. 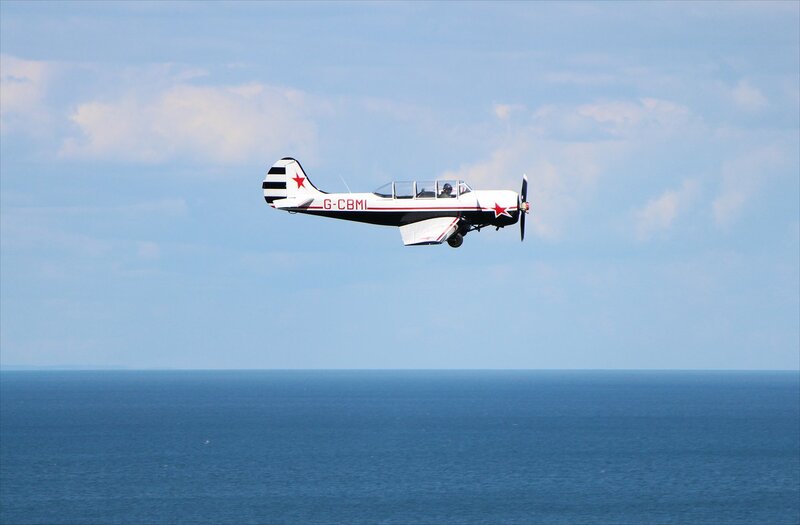 The Provost was a jet training aircraft which was produced in large numbers and successfully exported around the world. 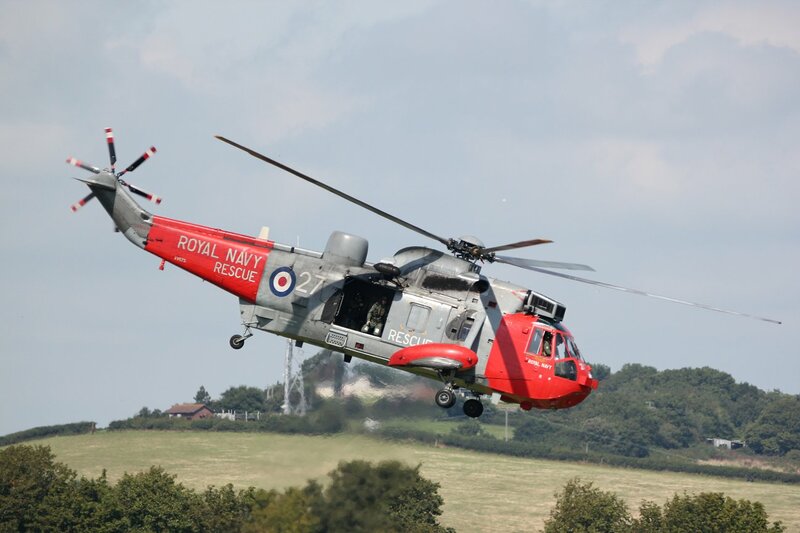 The trainer was in service with the RAF until 1993 so I would assume that I have seen one in the air before, but I don’t have any particular memory of seeing one in flight. 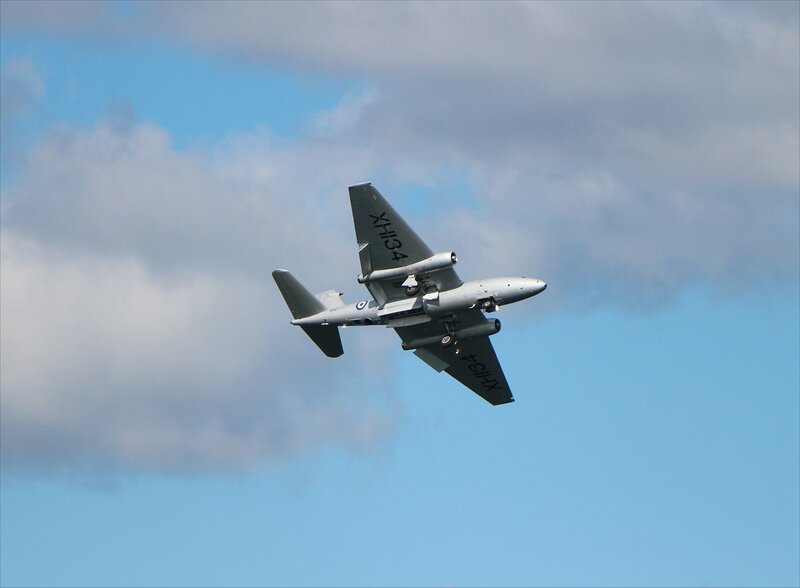 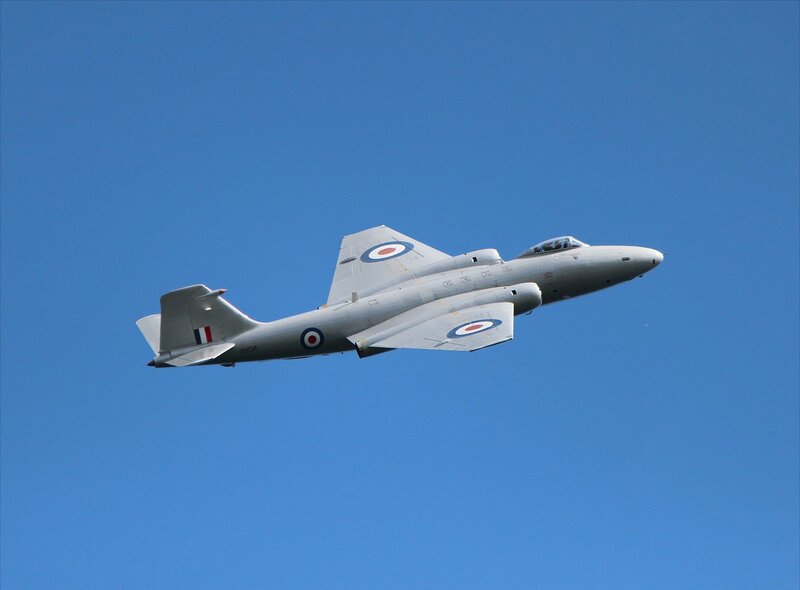 I had already seen the Canberra at Farnborough, but you can never have too much of these classic jets! 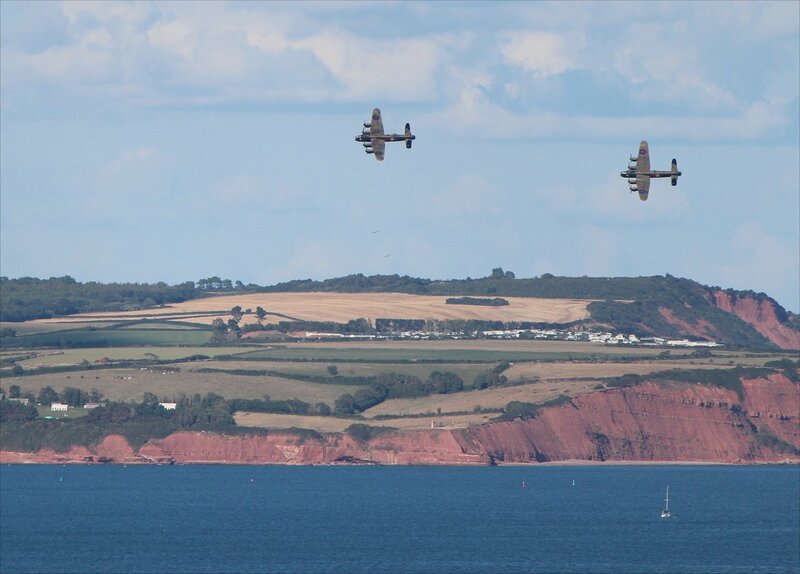 Other aircraft at the airshow included a Beechcraft Model 18 light transport plane, a Whirlwind helicopter, a RAF Shorts Tucano and Rich Goodwin’s Muscle Biplane.